Diamond Nexus Round Cut Studs. Everyone should own this ultimate classic! These refined solid 14k gold settings show off a pair of Round Brilliant cut diamond simulants in basket settings: the original must-have jewelry staple! Screw back posts ensure they’ll stay put through just about anything. Center stone: 0.93 carats each! 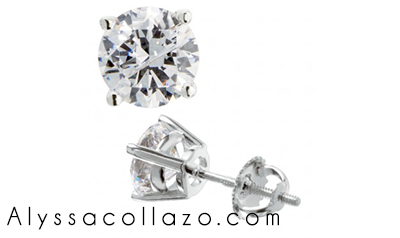 These Studs are classic, elegant and simple. Every girl needs a pair of these beautiful Round Cut Studs!! And since Christmas is right around the corner Diamond Nexus is giving ONE of my lucky followers a pair of their own Round Cut Studs, a $249 Value!! How AWESOME is that?! One (1) winner will receive: A pair of Round Cut Studs from Diamond Nexus. Ends 9.16.14. I love the drop earrings. Gorgeous! I love diamond studs! Oh These are beautiful and the great thing is they go with everything! Very nice! How nice. I Have always wanted a pair of diamond studs. Emma could use some new pretty diamonds for her birthday! Thank you for the chance!! By the way... I love the Christine pendant! These are BEAUTIFUL! I know a certain little gal who would love these! Love love love the Josie earrings! WOW!! What an incredible giveaway! I have a pair of diamond studs that I was given for my 18th birthday that I still have and wear all the time! Ooh I love the High Society Earrings. Especially the color! Beautiful earrings! They look fantastic with anything. Who doesn't love a pair of diamond earrings? I already have a pair but the more the merrier! Who wouldn't want to win some impressive-looking jewelry? If it's for yourself or someone you love it's worth a shot to enter. I love drop earrings and the Chance Earrings are beautiful! I love diamond studs! I have 1 pair I need a 2nd pair! I really like the Veronique Earrings! Love the flaming heart pendant! I Love the matched set and would Love to win these beautiful set of earrings for my daughters birthday on the 29th. I liked the Flaming Heart Pendant. The drop earrings are pretty. I really like the Marilyn Necklace. I love the Ophelia Teardrop earrings with the rose center! So pretty! Ah! These are seriously so beautiful! I would love to give these to my momma for Christmas!